By CARP West Africa, Rev. 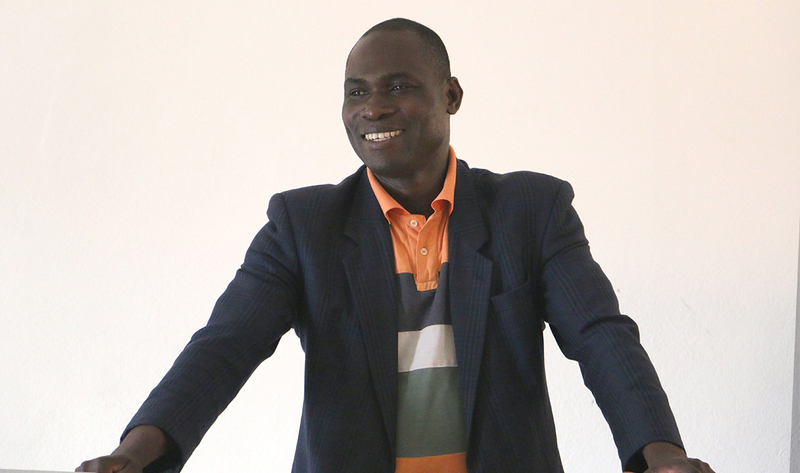 Eugene Ahondjo August 12: The first international 21-Day’s seminar for CARP in West Africa region started on July 27th and will end up on August 16th, 2015. Abidjan, the capital city of Côte d’Ivoire is holding the workshop initiated by the FFWPU West Africa HQ under the leadership of Rev. Dr. Cho Dong ho, the regional president. Fifty seven students from high school to university have joined, coming from six countries, opening a way for second generations to deepen their understanding of True Parents’ teachings and life course and to know each other. The workshop is piloted by West Africa CARP president, Rev. Ahondjo with the support of Youth Special envoy, Hiroki Matsuoka. The core of the seminar is to help young unificationist to “become dutiful children who will accomplish vision 2020.” As stated the banner. Under difficult environment, children are studying diligently and sharing good brotherly times. For the first time, they come to know each other and spending time and making unforgettable memories, as some mentioned after spending more than ten days together. On 27th of July at 3:00 pm, the opening ceremony was held in the presence of the special envoy, the West Africa CARP president and FFPWU Côte d’Ivoire staff; president, education department’s director and the secretary general. After the prayer, FFWPU president addresses the welcoming remarks to attendees expressing how lucky there are as second generation gathered together to learn True Parents words and deeds. He was followed by CARP president who explained the motivation of the workshop, and how it was of a great concern for FFWPU West Africa president, Dr. Cho Dong ho. Each country was introduced and the ceremony ended with a commemorative photograph. After the official opening ceremony, orientation session was held. It was an occasion to establish teams, decide team leaders and start to know each other. Glass breaking activities was conducted by Hiroki to help create a brotherhood sense for all. 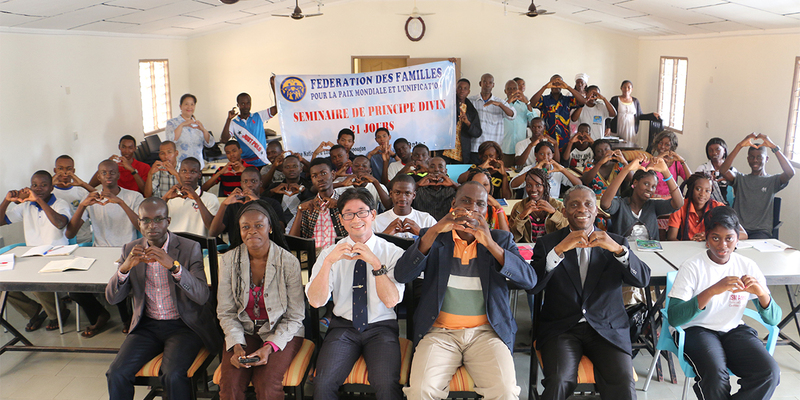 The next day, 28th , lectures started with a presentation on Family pledge by Hiroki Matsuoka translated by Mrs. Furukawa, a Japanese sister blessed to an Ivorian brother in 1992. 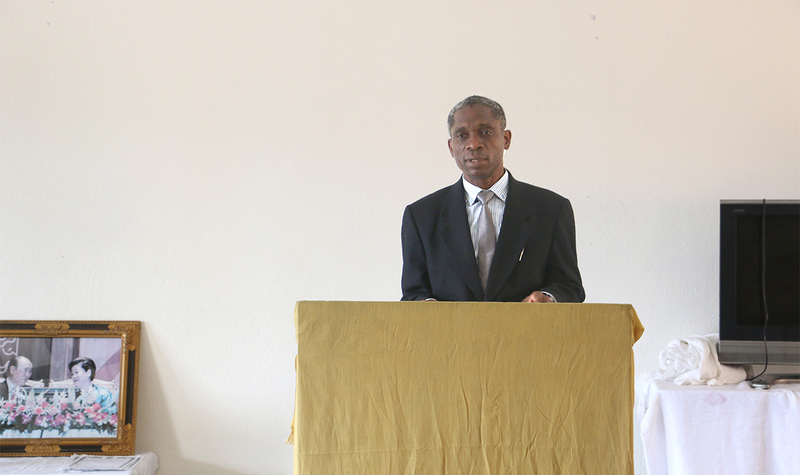 From July 29 to august 5, lecturers presented DP contents to students. Every morning all participants attend hoondokhae. The hoondokhae is based on True father autobiography. The reading of 30 mn followed with discussions within each team. Seven teams were made. When young people speak to each other they are more open and less shy; expressing freely and without any complex. After Hoondokhae, they participate in a special exercise bringing everyone to exert the sense of team work and living for the sake of others. Every night, all teams gather to discuss the content taught during the lectures and to practice DP lectures. After arriving from a tour in central Africa, Dr. Cho came on 5th morning to meet workshop participants from 9:00 a.m to 10:30 a.m. He spoke briefly about True Parents course and the status of unification church members in the current providence. On Saturday 8th, he came once again to share his heart to CARP members and took picture with each country participants and present the scholarship to beneficiaries who attend the seminar. Dr. Cho explained to them how concerned is our True Mother for our students and how important for them to be the best in their classes, so to earn scholarship and have the opportunity to study in Korea, the homeland of True Parents. The six of July was reserved for sport and entertainment preparation for the coming national Sunday service to be held on July 9th. On that Sunday, all participants were introduced and invited to offer songs. It was amazing to look and listen to an improvised choir singing beautifully. We have come to notice that after a week of living together their relationships are so good despite time to time quarrels that never last long. True Parents life course during two days lead them to appreciate their life and be more concerned about them, realizing how true father and true mother were so faithful to God in spite of all difficulties. The internal guidance based on Daemonim lectures bring them to understand the model life style that they have to live as children born from TP linage. Since 12 of august they started fundraising to last three days. It was the first time for many of them to do FR. They are invited to collect money based on a project concerning a social issue; early pregnancies in primary and secondary school. The total goal set for all is 1000 US dollars in 3 days. The amount is divided in goal for each team. All teams have to strive to reach their goal and also help other teams when they cannot attain their own goal. As some mentioned when they come back; they could understand the path followed by their parents in the church and come close to feel God’s Heart.